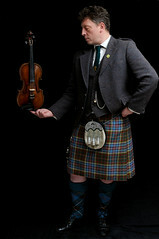 A wee taster of the photo shoot I did with Paul a few weeks ago. Due to holidays and going back to work with a bang, it is only now that I can share some of them with you. Hope you like them and I'm open to your thoughts as I'm not normally a portrait photographer and I don't have a studio or studio lights. We enjoyed doing them! Paul was happy for me to take some shots knowing I didn't have any studio lights or a studio. I got some black curtains and rails from Argos and put them on the wall and on the floor. Just in front of Paul is a white sheet to reflect some light up. I set up a SB600 off camera to the left and a small reflector to the right. Some natural light came in from the left. We knew we were going to do something with the fiddle suspended and Paul would be in full kilted dress, so it a bit traditional and a bit fun. Please tell what I should do to improve as inside portraits is not my normal shoot.